Here is a great accessory for your patio awning. This SunSetter Mat is a great looking, rugged floor mat that adds style and comfort while it protects your deck and bare feet! 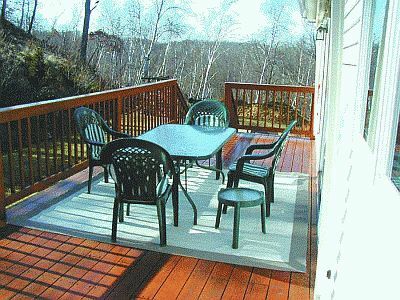 This will help to keep your patio or deck beautiful because it keeps furniture legs from marring the deck surface, and makes your deck a comfortable place to walk. And if you have a pool, the textured finish will make the deck surface less slippery. It also protects against splinters and rough spots. Prevents furniture scuff marks. If you enjoy going barefoot inside, then you'll love it when you add this mat because it will allow you to remain barefoot outside on your deck or patio. This tough SunSetter Patio Mat is a great addition to any deck or patio. It will also make your awning area more comfortable for guests when you entertain. Not only are they comfortable on your feet, they also add a decorative touch to your deck or patio and you won't have to worry about mildew ruining its appearance. Each mat is constructed of rugged vinyl-covered polyester whose textured surface helps to prevent slipping and scuffing. Your mat will last for years and maintain its color! They are also mildew and flame resistant. Lovely neutral tan and brown color combination complements any decor. These mats are available in three sizes: 9'x9'; 9'x12'; 9'x16'.